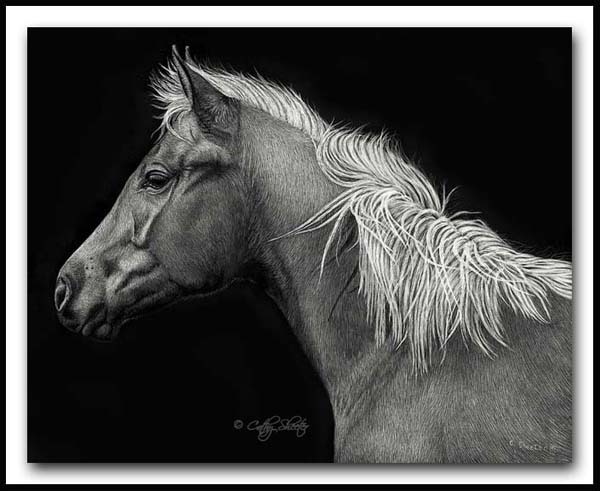 The Scratchboard Art of Cathy Sheeter - "At Attention"
On a photography trip to North Dakota my boyfriend and I decided to visit a mustang sanctuary. As we waited for our tour to begin I walked over to check out the pens of horses waiting for adoption. Out of the 100+ horses in the pens this little palomino colt really caught my eye. I liked the way he was built, his wild mane, and enjoyed the overall interactions with the other horses (spunky but not a bully). He did not go home with me, but his photos did and I felt compelled to capture this little piece of the American west, who I hope was adopted into a great home. Original Donated to the Rotary Club of Loveland in conjunction with the 2012 Colorado Governor's Show.